Middlegame - Become a wizard in the art of combinations with the intensive course on tactics, CT-Art 3.0, and learn the positional methods used by grandmasters in Strategy 2.0. Study typical middlegame structures and their plans, arranged depending on the openings they come from, with Encyclopedia of Middlegame. Endgame - Instead of boring lectures, learn endgame technique with the use of breathtaking artistic endgame compositions, chosen for their relevance to real play, with Studies 2.0. Altogether Total Chess Training includes more than 9000 commented games and positions to be solved for chess players with ELO rating from 1800 to 2400! 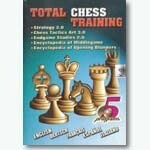 Total Chess Training is the product of the best Russian chess instructors' efforts. Take advantage of their training and knowledge now, and raise your playing level to a new standard. Product SpecificationsNote: All weights, dimensions, and other measurements are approximate. System requirements: IBM-compatible PC, 32 Mb RAM, hard disk 100Mb, Windows 2000/NT/XP/Vista, CD-ROM drive, No additional software required.